All that said, Greg Pak does seem to be pulling some of his punches with this massive crossover event story. Without spoiling anything, it is quite clear that he sees the Hulk as the hero in all of this – perhaps not too surprising given the story flows from Planet Hulk, which is remarkable for constructing a narrative in which the green goliath is undoubtedly the good guy. Even in his rage and anger, Pak makes it clear that the character has lines he will not cross to avenge the loss of those close to him. It’s an interesting idea and one which portrays the character with more self-restraint than I honestly would have expected. Given the sheer scale of carnage and mindless violence the character has been capable of without any sort of personal motivation, it seems odd to see his adopt what is ultimately a tempered and nuanced approach. That said, it fits well with Pak’s story and (arguably) with the bright primary colours and almost simplistic designs of Romita’s superb artwork. This is a story that is a breather from the moral ambiguity which has become common place in the Marvel Universe, with heroes murdering heroes and arresting one another. You could argue that Pak’s story lacks a clear-cut villain (in that each character has their motivations), but it does possess heroes. This is a story with good guys, rather than one populated with ambiguous morals. And it’s clearly structured as such, perhaps in a direct response to what has come before. Pak suggests in this story that the superheroes who exiled the Hulk – the Illuminati consisting of Tony Stark, Reed Richards, Black Bolt, Professor X and Doctor Strange – are “the real monsters” of this story, continuing and developing the theme of moral uncertainty which runs through most of Marvel’s output I’ve been covering these past few weeks from the launch of New Avengers to the conclusion in Siege. 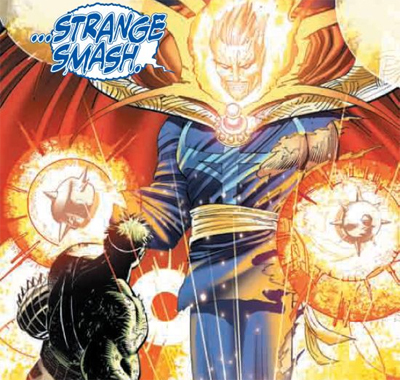 “You call them heroes,” the Hulk declares at one point, “I call them monsters.” Indeed, we witness Doctor Strange searching for “a hero” to fight the Hulk, but seemingly without luck. There are no real heroes anymore, just vigilantes. The Hulk lands in a world very different from the one he departed. The divide created by Civil War still obvious, and weighs heavy on everyone even in the midst of the crisis. “You think there has to be sides,” She-Hulk accuses one of her colleagues as they prepare to face the Hulk. “Cap’s dead,” his old friend Rick Jones explains, a statement strong enough to stop the Hulk in his tracks, “A lot’s happened since you’ve been away.” As the Hulk rampages through this new landscape, it seems that “everything he sees just makes him angrier.” This isn’t a world as simple as it once was – although perhaps the Hulk wishes that it were. Indeed, when the Hulk subdues his opponents (in a series of impressively illustrated battles across Manhattan, might I add), he almost puts these figures on trial in Madison Square Garden – he even has witnesses and victims of their atrocities lined up. “Liars. Traitors. And killers.” And, truth be told, he isn’t objectively wrong. In the past few years, these characters have been all that. Indeed, Doctor Strange himself is so morally compromised that he has to partner with a demon and risk “hell on Earth” to fight the Hulk. By the way, am I the only one who finds it strange that the public are so damn accepting of the Hulk’s rampage and far too ready to accept his side? I mean, I know that all the superheroes are morally compromised, but there are people actively cheering the monster on, regardless of the damage he’s caused. In fairness, this is the fictional New York city in the Marvel universe which would support measures like “mutant registration”, so I can’t say I’m too surprised. General Ross remarks on the cycle with the Hulk – sometimes he’s a hero to be lauded rather than a villain to be feared, but public opinion is fickle – prone to change at the shortest possible notice. I have to admit, I’m surprised that the Hulk hasn’t featured more heavily within the central narrative of the Marvel Universe, as it deconstructs the notion of the super hero with events like Dark Reign or Civil War. I mean, the Hulk is the perfect example of a morally ambiguous superhero in the way that Bendis would portray Tony Stark and later (and much less ambiguously) Norman Osborn. He’s a character who causes huge damage in the pursuit of what is normally a greater good. Indeed, Pak perfectly juxtaposes Banner’s own insecurities with those of Bendis’ pet superhero allegory, the Sentry – both are characters with huge powers who can’t necessarily handle it well. That duality underscores a lot of the characters that are a part of this saga. As the narration reminds us, “within each of us live the worldbreaker who destroys all… and the sakaarson, who redeems the world.” The superheroes of the Marvel Universe need to decide which one they are – indeed, the whole fictional universe seems to be playing out the Hulk’s psychosis in recent years. Banner and the Hulk have been locked in a civil war for decades, after all. With all that said, there are still obvious problems with the miniseries, both in plotting and writing. The most obvious is the rather convenient ending that Pak shoehorns on to the event. Literally everything is wrapped up in a neat little bow and explained conveniently. Which is a shame, because the central premise of the series – which is a fascinating one – is gravely undermined by a last-minute reveal which robs the series of a lot of its complexity and makes things incredibly simple. The notion that Tony Stark’s actions had an unforeseen consequence which ended countless innocent lives is a powerful one (and one that I’m surprised hasn’t been broached before), and a logical follow on from the “with great power…” logic. However, the series doesn’t have the courage of its convictions, and that is somewhat unfortunate. By the way, did anyone else find it funny that the only member of Tony Stark’s Illuminati group who wasn’t tackled by the Hulk in this crossover was Charles Xavier, leader of the X-Men? Of course, the Hulk confronted the character in one of the inevitable spin-offs, but it’s notable that he’s the only one of the Illiminati (with the exception of Namor, who rejected the idea of exiling Banner) who doesn’t appear at all in the miniseries. It perhaps illustrates how greatly Marvel had isolated the X-Men franchise within their fictional universe that they couldn’t appear even when it seemed logical to do so. On the other hand, perhaps their appearance would have complicated the plot, but I’m always one for a Wolverine/Hulk face-off. World War Hulk is a fun crossover which gets away with a lot due its fantastic artwork and the fact that it’s easy enough to breeze through. I’m not necessarily convinced by the storytelling tricks employed by Greg Pak (indeed, some of them are quite suspect – including how quick the public embrace the Hulk or a last-minute reveal designed to absolve anyone of any responsibility for anything), but he spins an enjoyable yarn that is entertaining to read. It is – after all – five issues of Hulk Smashing. And, if you’re in the right frame of mind, there’s nothing wrong with that. Those looking for something a bit deeper might not be quite satisfied, but those looking for an entertaining and engaging Hulk story need look no further. Next up we’re back with a quick look at the X-Men crossover Messiah Complex (taking a look at what they’ve been up to since House of M) and we’ll follow that up with Brian Michael Bendis’ New Avengers (and, after that, Mighty Avengers). We’ll also drift back off into space with Annihilation: Conquest before we tackle his second big crossover (and one he’s been building to for years) Secret Invasion. All of these articles are written from the perspective of a (relative) layman who has never really attempted to follow comic book continuity before. Stay tuned, true believers.